Since the publication of the last 3MC monograph (2010), there have been substantial methodological, operational and technical advances in comparative survey research. There are also whole new areas of methodological development including collecting biomarkers, the human subject regulatory environment, innovations in data collection methodology and sampling techniques, use of paradata across the survey lifecycle, metadata standards for dissemination, as well as new analytical techniques. This new monograph follows the survey lifecycle and include chapters on study design and considerations, sampling, questionnaire design (assuming multi-language surveys), translation, mixed mode, the regulatory environment, data collection, quality assurance and control, analysis techniques and data documentation and dissemination. The table of contents can be accessed here. Johnson, T. P., Pennell, B.-E., Stoop, I., & Dorer, B. (Eds.). (2018). Advances in comparative survey methods: Multinational, multiregional and multicultural contexts (3MC). Hoboken, New Jersey: John Wiley & Sons Inc. 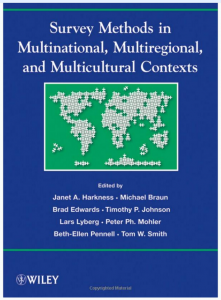 Written and edited by experts in the fields, Survey Methods in Multicultural, Multinational, and Multiregional Contexts provides an overview of comparative multinational, multiregional, and multicultural issues in survey methodology. Part of the Wiley Series in Survey Methodology, this volume explores the issue of quality in multipopulation surveys and the level of methodological expertise in comparative survey research. The text, including models of design, multilingual issues, and more on developing countries, is fundamental for statisticians, researchers, and students interested in design and implementation of international, national, and cultural comparative surveys. The text received the 2013 AAPOR Book Award – “recognizing influential books that have stimulated theoretical and scientific research in public opinion; and/or influenced our understanding or application of survey research methodology”. To purchase a copy, please follow this link. Harkness, J. A., Braun, M., Edwards, B., Johnson, T. P., & Lyberg, L. E. (2010). 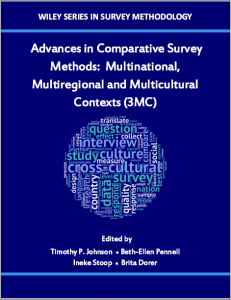 Survey methods in multicultural, multinational, and multiregional contexts. Hoboken, New Jersey: John Wiley & Sons. First published in 2008, the Cross-Cultural Survey Guidelines have recently undergone a significant update and expansion (Beta release: July 2016). The new edition includes over 800 pages of content with major updates and the expansion of all existing chapters, as well as the addition of new chapters on study design, study management, paradata, and statistical analysis. More than 70 professionals from 35 organizations contributed to this effort. The senior editor was Tom W. Smith of NORC at the University of Chicago. See: http://ccsg.isr.umich.edu/index.php/about-us/contributions for a complete list of contributors. The Cross-Cultural Survey Guidelines were developed to provide information on best practices across the survey lifecycle in a world in which the number and scope of studies covering multiple cultures, languages, nations, or regions has increased significantly. They were the product of an initiative of the International Workshop on Comparative Survey Design and Implementation (http://www.csdiworkshop.org/). The initiative was led by Beth-Ellen Pennell, currently the director of international survey operations at the Survey Research Center, Institute for Social Research at the University of Michigan. The aim of the initiative was to develop and promote internationally recognized guidelines that highlight best practice for the conduct of comparative survey research across cultures and countries. The guidelines address the gap in the existing literature on the details of implementing surveys that are specifically designed for comparative research, including what aspects should be standardized and when local adaptation is appropriate. The intended audience for the guidelines includes researchers and survey practitioners planning or engaged in what are increasingly referred to as multinational, multiregional, or multicultural (3MC) surveys, although much of the material is also relevant for single country surveys. The guidelines cover all aspects of the survey life cycle and include the following chapters: Study Design and Organizational Structure; Study Management; Tenders, Bids and Contracts; Sample Design; Questionnaire Design; Adaptation; Translation; Instrument Technical Design; Interviewer Recruitment, Selection, and Training; Pretesting; Data Collection; Paradata and Other Auxiliary Data; Data Harmonization; Data Processing and Statistical Adjustment; Data Dissemination; Survey Quality and Ethical Considerations. The guidelines can be found at: http://ccsg.isr.umich.edu. We welcome feedback and suggestions. The World Association for Public Opinion Research (WAPOR) and the American Association for Public Opinion Research (AAPOR) jointly support Dr. Harkness’s work by sponsoring the Janet A. Harkness Student Paper Award each year. This award recognizes “emerging young scholars in the study of multi-national/multi-cultural/multi-lingual survey research (aka 3M survey research) through support of the winner’s participation in the WAPOR Conference and a cash prize.” Please follow this link to donate to this effort in gratitude for Dr. Harkness’s legacy in the field of cross-cultural, comparative survey research. Dr. Janet A. Harkness initiated the International Workshop on Comparative Survey Design and Implementation and was one of the driving forces for the Cross-Cultural Survey Guidelines (http://ccsg.isr.umich.edu/). Dr. Harkness passed away in 2012. 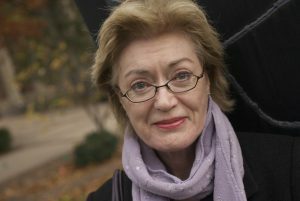 She inspired and influenced cross-cultural research and work through her steadfast conviction that resources must be made available to researchers and survey practitioners if we are to improve comparative survey research methods, dissemination and analysis.